I love decompiling stuff, i did that for facebook 3D photos recently, but this time it will be about marvelous Tao Tajima website. Go check it out first. The website has been done by Homunculus studio from Japan, and the developer of the website is Yuichiroh Arai. I want this case study to honor his skills and ideas he implemented on this beautiful website, as well as his team. Thank you guys for creating one of the best and smoothest user experiences with WebGL out there, ありがとう. Hope they will read that :-). Let’s see how it all works! So your first thought might be: it is definitely something in 3D, some mesh being folded and unfolded like a manuscript. Some clever vertex shader morphing. Let’s investigate. 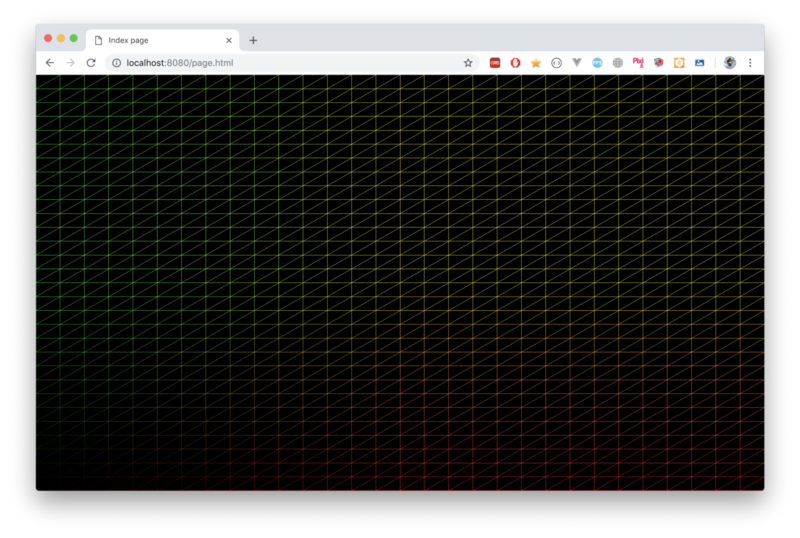 The website is featured on the three.js homepage, so it’s obviously using this library. My first idea was to reveal the vertices behind this smooth transition, to see the magic. That worked well in my facebook case. Turns out, there is no real 3D going on. It’s all done in a fragment shader! I intentionally added more vertices and colored them as UV coordinates. I’m assuming you know shaders, so if you are not familiar with them yet, go read amazing Book Of Shaders. Because of the texture movement, fold line looks dynamic now. Well, here we are, just a couple of simple steps! There is a little more, a bit of distortion, mirroring, nice easing function, but effect is already in place. Only half of it really, what about the dynamics of the scroll? Did you try to scroll website really hard? you start scroll, then scroll is hijacked, and you wait until animation finishes. You can’t scroll 3 sections. What we see in taotajima.jp is different, more dynamic, it doesn’t really matter how much you scroll and how fast you do that, it will go with you infinitely. The idea is very simple, yet, a brilliant one. Imagine, there is a number, which means how much you scrolled up or down. In the usual page case, it is just scrollTop position. But let’s say in our case, if you scroll down hard, its +1.0, if you scroll up a bit, it’s -0.5. What if we just take fractional part of this number as a slideProgress and integer part as a current slide number. It works! Notice scale on the left, with actual values. This idea is not specific to .glsl, we might use it to build some cool DOM sliders as well. Let me know if you used it before! Let’s share ideas. So here we are, two brilliant ideas from one transition effect on the website. Of course, there is much more to this website than it’s homepage, and i highly recommend of going to the sources of websites you love. As we can see, one might always learn something new. I learned a lot from Yuichiroh’s project, even though we never met.